The stereotype of the second generation of Shenzhen villagers being “rich, lazy, mah johng playing, playboys (who might also do drugs)” is not only predicated on the idea that all of Shenzhen’s original inhabitants are rich, but also that their children have grown up aimless. However, Bao’an County’s original 300,000 residents and their children were not all created equal. What’s more, they increasingly find themselves belonging to antagonistic economic classes, while their children come of age grappling with problems that none of their parents imagined facing. Some second generation SZ farmers must look for wage labor in factories that (rumor has it) do not hire locals, preferring instead to hire migrant workers, even as other second generation SZ farmers are the first in their family to gone to college, and still others are, yes, struggling with too much wealth. The inequality among locals has been created through reform era legislation and urban development projects, which have built upon and elaborated historical inequalities and traditional norms. In an earlier post, I charted the borders and corridors that have shaped economic possibility and subsequent patterns of urbanization in the SEZ, arguing that three borders have enabled urbanization in Shenzhen: the border with Hong Kong, the second line, and the city limits, which abut Dongguan in the northwest and Huizhou in the northeast. Two economic corridors have facilitated Shenzhen’s growth: the Guangshen highway corridor and the Kowloon-Canton Railway. The Guangshen highway corridor parallels the area’s riparian trade routes, which were the means of Han expansion from Guangzhou southwardly on the Pearl River and its tributaries. The KCR, of course, was the British attempt to preempt and redirect the PRD’s extensive trade network. Not unexpectedly, proximity to a border or corridor has been a condition of reform era riches. Villages near the nexus of these borders and corridors have had disproportional opportunities to build and manage industrial parks and real estate developments. The earliest villages to get rich, for example, were all located along the Shenzhen-Hong Kong border at corridor checkpoints — Shekou (Fishing 1 and Wanxia) and Luohu (Hubei), first, but then Huanggang (Huanggang, Shuiwei, Xiasha, and Shangsha). However, guanwai villages retained land rights a full 12 years longer than did guannei villagers, with the result that largest and wealthiest village joint stock companies are now primarily located along the Pearl River Delta (Shajing and Huaide) and KCR corridors (Nanling near Buji). Consequently, many villages have remained “stuck” in between these two different modes of production, neither farming nor investing in manufacturing, let alone transitioning to the new creative economy. 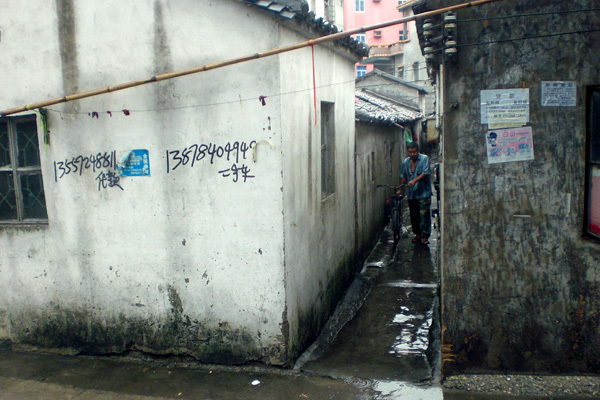 Areas of relative poverty include many Longgang District Villages as well as villages in Gongming and Guangming. However, proximity to the borders and corridors has not in itself created the conditions for villages to transition from lives based on rural production to lives based on urban industrial manufacturing. In addition to the construction of infrastructure, differences in Mao-era administrative designation have also shaped current inequalities among villagers. First, successful villages have operated as collectives, rather than relying on individual efforts. These villages not only inherited Maoist organization, including management experience, but also inherited common ancestry. Thus, single surname (一姓) villages, which have renovated ancestral halls and promoted traditional rituals have generally been more organized than random surname (杂姓) villages, which were created during the Maoist era for production purposes. Second, successful villages have had traditional land rights, which were extensive. Indeed, most traditional villages have made their fortune through land deals. In contrast, fishing villages (渔村) and overseas Chinese villages (桥村) had foundation rights (宅地), but not land development rights. This meant individual villagers could build private homes, but that villages could not collectively invest in industrial parks or real estate developments. Moreover, villages did not benefit from compensation deals between developers and nearby traditional villages. Third, as recent events in Wanfeng demonstrate, some village heads have been less corrupt than others, while the success of Huaide, Nanling, Huanggang, and Xiasha Villages has been directly attributed to the foresight of the incumbent leader. It is an open secret that legislation has been the source of Shenzhen’s competitive advantage, both for outside investors and for indigenous Bao’an villagers. What’s more, this legislation did provide the framework for many local villages and individual villagers to become rich. Indeed, when Deng Xiaoping died in February 1997, Shenzhen villagers openly wept and brought funeral wreathes to the statue at Lianhua Park and his Shennan Road billboard. Nevertheless, the emergence of class differences within and between villages directs our attention to the ways in which Shenzhen has displaced Bao’an as “the local”. Within this new locale, hometown status no longer provides a viable identity because locals have been segregated into urban classes that have disrupted traditional rural relations, even as they learn to navigate a hometown that is no longer theirs, assimilate the mores and customs of urbanites, and speak standard Mandarin, rather than local Cantonese or Hakka dialect. And in this new world ordering, poor Baoan locals embody a poignant form of global tragedy. This entry was posted in noted and tagged baoan, history, inequality, politics, proletarianization, random surname village, rural urbanization, rural village, shenzhen identity, single surname village, urban village, urbanization. Bookmark the permalink.